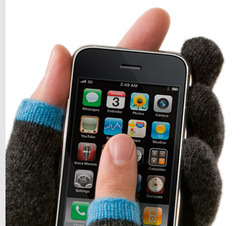 Yes they are gloves – but yes you can also use your iPhone with them! ZOMG! How on earth has this technical feat been achieved? Well as you may observe from the picture – by cutting some of the fingers off. Casting a cynical eye over the Etre Touchy, as the gloves are named, you could say that it is simply a fingerless glove rather than an amazing technical innovation. You would be right. We say: well they look alright and fingerless gloves are kind of cool but do you really want to spend £19.99 on them? Your call. North Face actually do some techno-gloves – have futuristic shiny conductive bits on the thumbs and forefingers. When you put them on you have to do impressions of Tom Cruise in Minority Report swishing things about on the big screen.